There are 14000 Fireworks Displays in the U.S. Hundreds of people gather at Bayfront Park for the annual 4th of July fireworks show. The display caps a day of patriotic celebrations in Miami, including a parade in Key Biscayne earlier in the day and a concert in Coral Gables at night. The fireworks are accompanied by a kid zone featuring face painting and other kids’ activities. 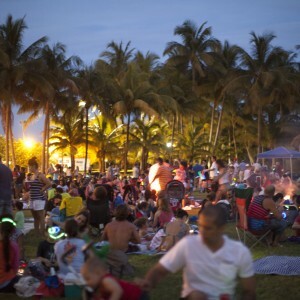 TALK Miami Beach celebrates America’s birthday bash on the 4th of July at Bayfront Park, proclaimed the biggest and best of all fireworks displays in Miami and happily the closest of all venues to the school! The fireworks display is made all more spectacular because of the backdrop of beautiful Biscayne Bay, along with live music which starts at 2 pm and continues all the way until fireworks time. Food, Drinks and the kid zone make it a fantastic fun-filled event for all ages. Fireworks start at 9:00 pm and the display lasts approximately 30 minutes. Celebrate America’s Birthday Bash in America premier party city!